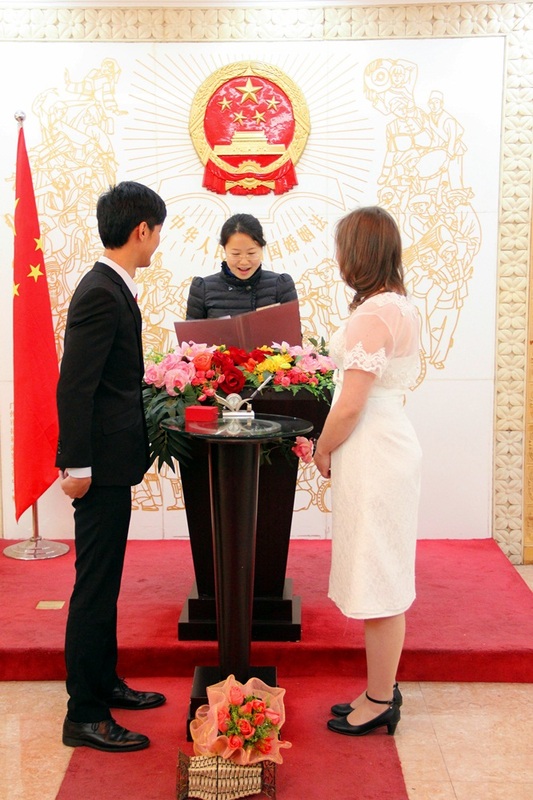 On February 14th 2014 came the most important day of my life so far, me and my Chinese fiancé got legally married. Alan has been away for business for five days and I was worried if his flight would be on time on Valentine’s Day. I had all these terrible scenarios on my mind of what could go wrong. But you know what? Everything went so perfectly that it’s hard to believe! My fiancé Alan was the first to arrive at the Guangzhou Foreign Marriage Registration Office and I arrived by taxi just a few minutes later. After that Alan’s parents, sister and brother-in-law arrived as well. I will write more about the paperwork side of things on a separate blog post, but in short, it was very easy to get our marriage certificates. You would just get your number and let the staff point you to the right directions for filling out forms, paying, taking photos and for the official ceremony. After filling our forms we had about fifteen minutes to take some photos at the decorative hallway. As this is an office that only deals with foreigners marriages, I think they want to make a good impression on us on how smoothly things go and Chinese elements were to been seen everywhere. Getting married in this special office was very nice for two other things as well. First of all there was no rush even though it was Valentine’s Day. They did say it was their busiest day of the year, but still the staff had time for us to have a special ceremony, something that Chinese-Chinese couples don’t get. 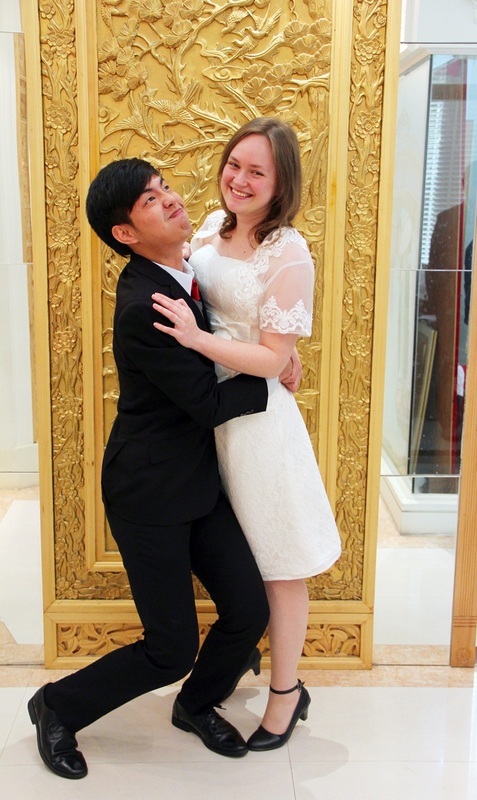 Secondly the staff took many pictures of us and in the end we could buy a cute wedding album with nine photos. The album also has pockets for our marriage certificates (the red booklets) as well. After some more cute photos, it was our turn to start the official ceremony. Us and our family members were asked to the ceremony room where we started taking a lot of photos according to the staff member who guided us for different poses. I had no idea that the wedding ceremony would be this interesting as I thought it would be more like a “sign the papers and get the booklets”. 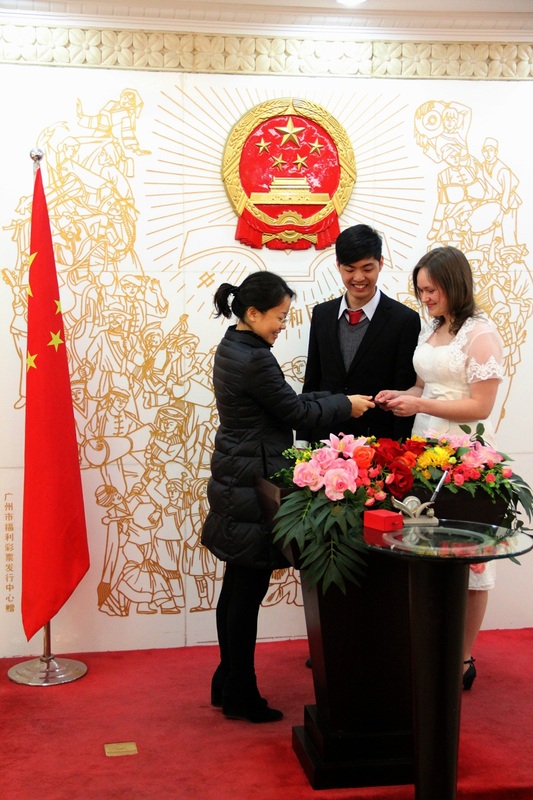 It was a very nice surprise to see that us Foreign-Chinese couples got some special treatment and attention. After all, at least for me this was the actual wedding day which will later be celebrated on anniversaries. For Chinese it might be just getting the paperwork done and that’s it, the wedding reception is much more important for them. After posing for photos the marriage officiant came in and said a few words that I really don’t remember. Then we had to read our “vows” from the forms we had already filled and that were printed out. 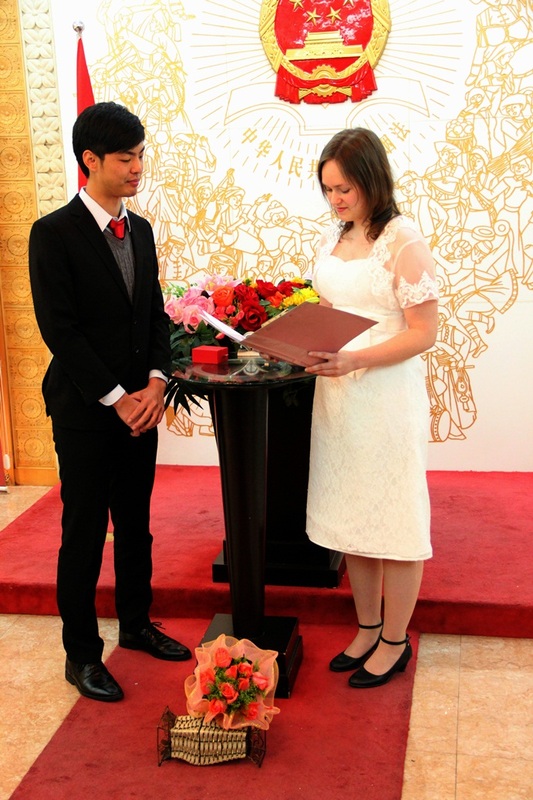 As I had filled mine in Chinese, I also had to read my vow in Chinese! I was super nervous but my dear Alan read quietly along me so I could pronounce all the words. It was the first reading aloud I’ve ever done, but luckily there is no recording of that! The vows included things like we vouch that we aren’t relatives by blood, that we are getting married by our own will and that we are clear of each others health situation. After reading we both signed the paper to make it legal. Then we exchanged the same rings we bought when we got engaged. We took the rings of at the beginning of the ceremony and now it was time to put them back on our fingers. In the photo below you can see as both very touched to receive our official marriage certificates. In that moment it really felt real that we are now husband and wife. We of course also had to take a photo with our new red booklets! Alan was surprised that we don’t have marriage certificate in Finland that look like passports, according to my knowledge it’s just a document in black and white. 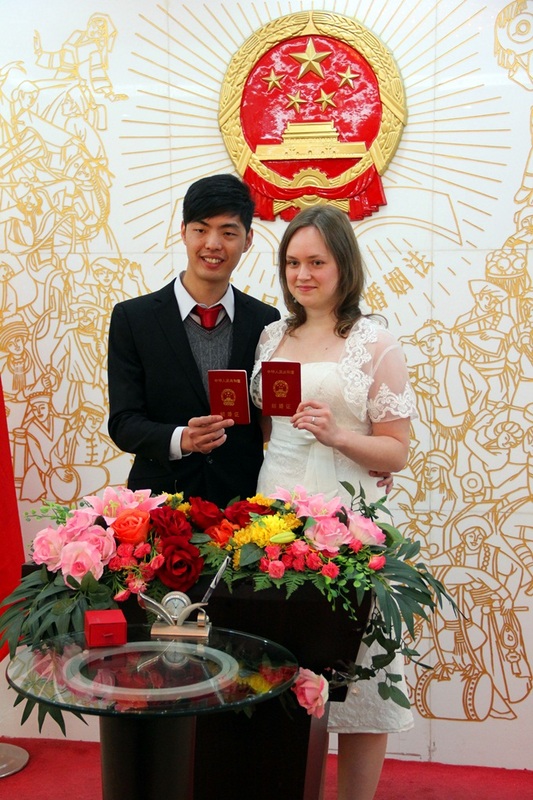 But in China you get these red certificates that includes a photo of you two and your information. A kiss to seal the marriage! Finally was my time to surprise Alan and we hopped into a taxi without him knowing our destination. He was super surprised to see that we get off at the Westin Pazhou Hotel! It was time to celebrate with excellent food, five-star service, Finnish sauna, swimming and luxurious room. 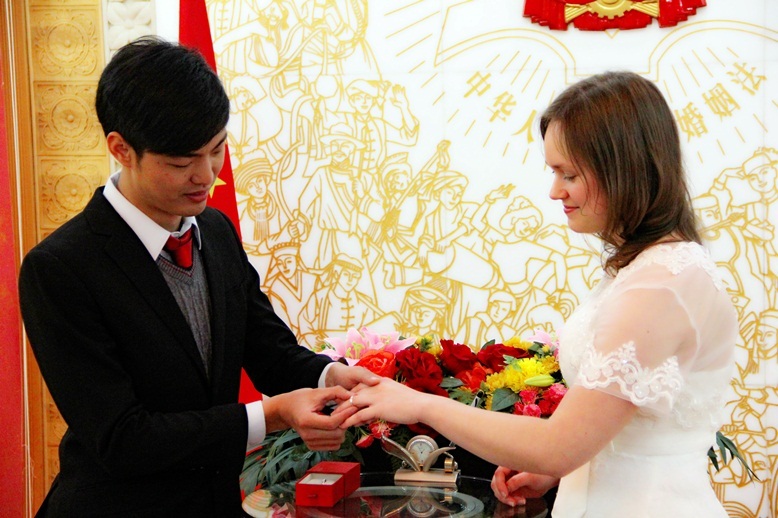 Even though we are now legally married, there is still a lot to write about getting married in China! Future posts will include the paperwork to be done in China, changes in addressing family members and planning the Finnish-Chinese wedding reception. Subscribe to my blog on the right sidebar “New blog posts to your inbox” or at the About Me page. 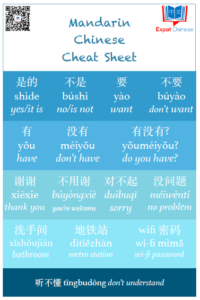 Living with Chinese in-laws...or not? Congrats, seems like the registration went really smooth! Wishing you a lot of happiness in your marriage and 白头偕老! Thank you! I was very surprised on how smoothly everything went. Hopefully last steps of the paperwork will go well too. Lovely photos. Congratulations on your marriage. May you have a long and happy life together. Hi Sara, I have been a follower of your blog since I arrived in China 5 years ago. 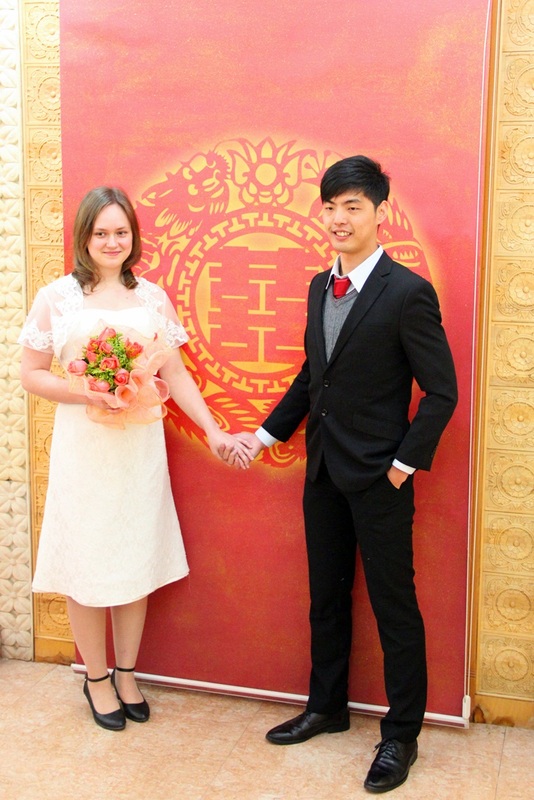 I’m so happy for you , you’ve over come some struggles and personal hardships but you made it through and now you have married your Chinese love, you look so happy :). I wish you and Alan many happy adventures together . It’s been a pleasure to have you as a reader all this time :) The road haven’t been easy, but I truly am as happy as I seem on the photos. Congrats!! :) Love your dress by the way, super cute! Thank you :) I really liked the dress as well, lace seems to be popular this season, at least in Finland. Congratulations! You two look so happy in the pictures. Wishing you a marriage full of happiness and love. Thank you Hugh! 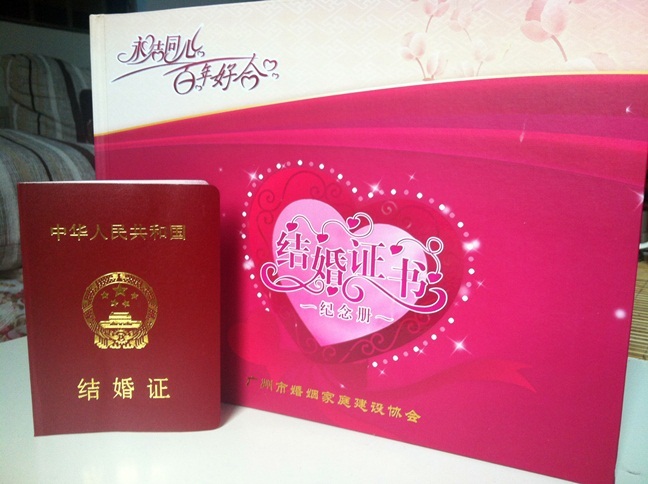 Hope it helps someone who is planning to marry in China or is interested in the topic. So excited for you Sara! 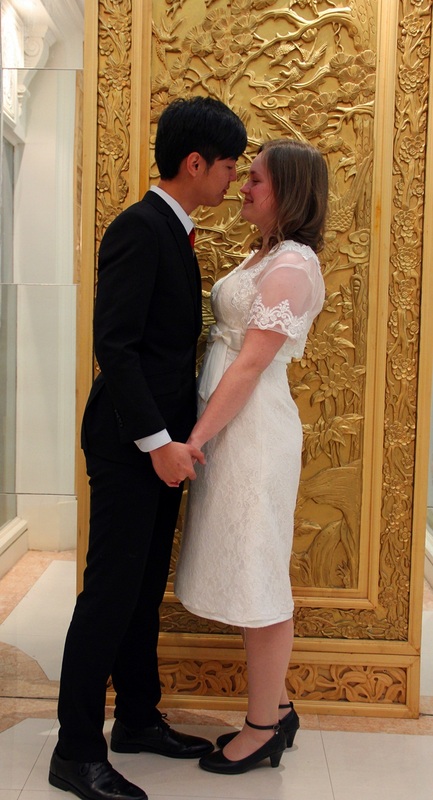 Love the photos, which bring back memories of when we registered our marriage years ago in Shanghai. Thank you Jocelyn! Was your wedding ceremony similar to ours? Our registration ceremony was similar in a lot of ways to yours, except we didn’t kiss at the end! Congratulations, looking forward to your articles about the wedding reception. Thank you TImo! Nice to hear about your wedding as well. I can imagine how much paperwork that would have been to get more family members there! Luckily her parents were able to participate. It would have been great to have you there and very interesting for you too I guess ;) Thank you so much for your warm words and I will see you soon! Congratulations on your wedding! I am so happy for you. I hope you were able to take some video as well-Best to you in the future! Thank you Cassandra! We didn’t take any video at all, but luckily we got lots of photos. Congraulations, Sara and Alan! So neat to see what marriage registration entails in different provinces. May you two have many happy years together! Thank you Charlotte! 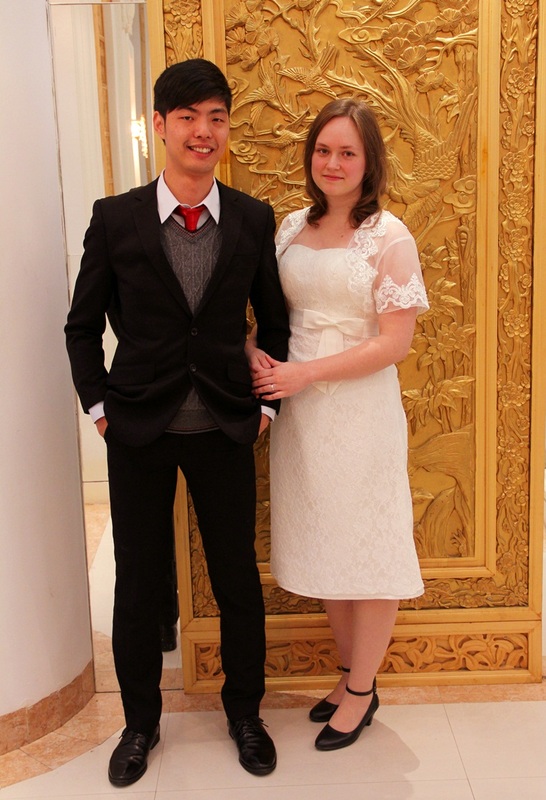 Have you seen other blogs describing the wedding ceremony in China? Would love to compare the differences as well. Sorry, I haven’t. I was just mentally comparing your registration process to mine. Ours was nothing special or exciting at all. So I feel very glad that this isn’t the case in other parts of China. 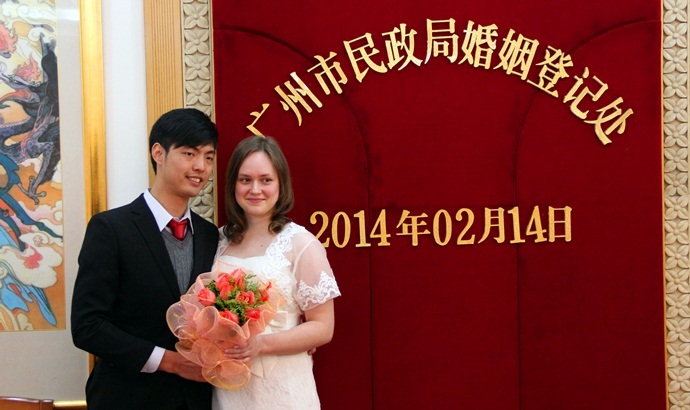 Hebei is quite a boring place, at least when it comes to foreigners getting married. 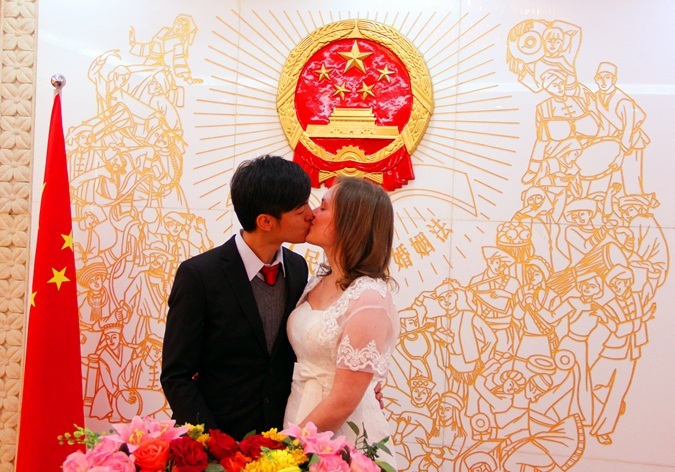 Perhaps it’s different for Chinese couples, and maybe it has changed since 2007. It could be because it was Valentine’s Day that they had a special ceremony for us, but not sure. Congratulations – you look great together! Thank you Marta :) I don’t actually feel that different yet, perhaps because we still live with the parents and not at our own place. Sure it feels funny that I don’t introduce Alan as my boyfriend anymore, but as my husband. My belated congratulations to you newlyweds! That picture of the kiss to seal the marriage looks so good and sums it all up. 祝你们白头偕老! Huimasti onnea Sara! Törmäsin sattumalta blogiisi joskus viime syksynä, kun tulin itse Pekingiin. Huikeita kokemuksia sinulla ja kirjoitat niistä koskettavasti. Ihana lukea elämästäsi ja nyt avioliitostasi, vielä kerran tuhannesti onnea! Shotgun wedding? Where were the friends and family and most importantly the parents? Bloggers Unite! How Blogging Has Enhanced my Life in China | Writer. Traveler. Tea Drinker. wow! you chose to 领证 on 14th of FEB and didn’t have to wait in a huge line??? I haven’t been married in China myself but I heard for specially days you need to wait in line for hours… you guys are so lucky and cute! best wishes!!! Chinese-Chinese couples pretty sure had to wait for a long time or make a reservation online for Valentine’s Day. 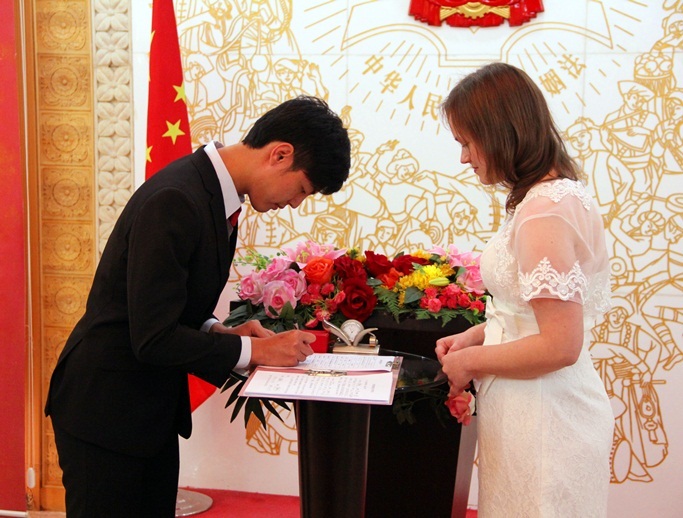 Luckily there aren’t so many Chinese-Foreigner couples getting married here, so getting the marriage certificates is very quick for us.